I've been on a Brussels sprouts kick lately. I can't seem to get enough of them. Much to my boyfriend's dismay. He doesn't share my love of the sprouts. 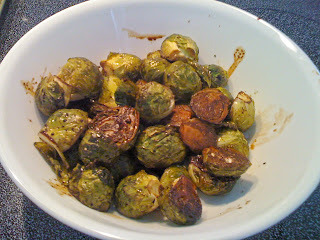 My new favorite way to cook Brussels sprouts is fast, relatively low cal, and tasty. 1. Cut Brussels sprouts in half, toss in mixture of ingredients. And voila! Tasty, nicely marinated Brussels sprouts. I tried this recipe tonight and enjoyed it quite a bit. Very simple and tasty.